Springtime. Fresh sprigs of grass poke through last year’s thatch. The flapping of wings fills our ears as birds build nests. The first whiff of summer’s warmth on top of a cool spring breeze. These are familiar signs of spring to us. What if this was your first spring? You’d wonder where the snow had disappeared and why you don’t have to bundle up in your winter jacket and mittens. You’d smell your first flower and it might make you sneeze. I love the fresh, new perspective of Margaret Rose’s picture book, First Spring. The rhyme and meter make the story a fun read aloud and the lovely pastel illustrations by Marina Movshina, will stoke a child’s imagination. Margaret, where did the inspiration for this point of view come from? Thank you for having me, Kai! It's a pleasure to find a brand new blog to visit. As you so eloquently stated, springtime is for new discoveries. You never really know what lies buried under the snow when you're a young child. I've lived in the north all my life and I've always enjoyed watching little ones go outside in the spring. I think about chubby baby feet pulled back from tickly grass. My children acted the same way, and so I decided to write about these things after my second son was born. What are the first signs of spring in your part of the country? Books are often compared to children, for authors. What is your biggest hope for First Spring? When I autograph these books to children, my wish is that their life is full of springtime joy. When someone reads this book to a child, I hope it inspires them to share a memory or make a new one with that child. Margaret, for fun, “fill” your ideal Easter basket for us. Let's see…chocolate is a requirement. Dark chocolate. A coupon for a nap, a bike ride, and a walk while holding my hand. A long conversation about what's happening in your life. An extra-large hug and a belly laugh 'til tears run down our faces. A busy Easter dinner after church and help with the dishes. And no crazy Easter grass in the basket because the dog drags it all over the house! Readers, do you have a springtime memory to share? 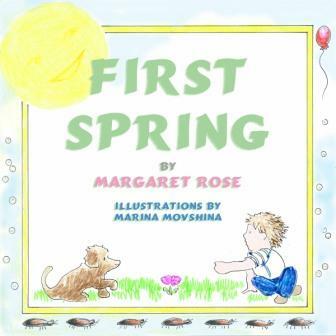 Margaret Rose is giving away an autographed copy of First Spring. Funny? Serious? Poignant? You write it. She can't wait to read it. Make sure you include your e-mail address. Contest is open through 4/14/11! Great interview Kai, I love Margie's books and am an avid fan. As for Easter memories, in my family the Easter bunny would leave one golden egg and there was always money inside so my cousins and I would always try to find that golden egg. One year it was on the roof of my granny's two story house. Another year it was in a Mockingbird's nest in the ancient magnolia tree. It was always fun trying to think outside the box. Hey MOTS! Lucky you didn't have to think from inside the ambulance with those kinds of hiding places! Thanks for coming by! Easter was always my favorite holiday. I guess probably because Spring was bringing the beautiful daffodils and tulips and it was the first sight of summer. Always a new Easter dress and bonnet. 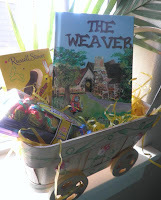 Our Easter baskets were always full with candy and a small gift. We would hunt for Easter eggs than have a wonderful home cooked meal prepared by my mother. The ham and deviled eggs always my favorite. I so miss those days as everyone has their own place to be so we are never together for Easter anymore. Great memories! Dawn, thank you for sharing a memory that sounds very much like mine. We always had hard boiled eggs, oranges and a pastry called potica for our Easter breakfast. I still do. thank you for sharing. Marguerite and Dawn, thanks for sharing your memories and for stopping by! We always dyed hard-boiled eggs then my mom and dad would hide them and my sister and I would hunt for them. I did the same thing when my boys were little. Lots of fun, especially eating the eggs. Hi Beverly! There were 6 of us in the house and usually lots of snow still on the ground so it was a challenge for my folks to hide our baskets! We did egg hunts for our kids until last year... :-( they finally outgrew it. Darn. Thanks for coming by. Gorgeous post and interview...I remember brightly colored eggs, hunting them even in the rain, umbrellas perched on our shoulders, festive table, leg of lamb, best china and silver and, of course, permission to eat lots of chocolate! Great memories, and thanks for suggesting we revisit them! Thanks for sharing the interview. Spring and Easter are my favorite time of year. I remember as a child coloring Easter eggs and trying to find them, including ones hidden in the house. Once we missed one, and I still remember the awful smell that later led us to find it. When I had my own children years later, we decorated boiled eggs but hid plastic ones filled with candy, so no worries of rotten eggs! The egg dying and hunting were always my favorite part of Easter, as a kid and as a parent. Last year we hosted a 16 yr old student from Japan and she dyed eggs with us. So much fun to share that silly custom w/her. Hi Nancy! Thanks for visiting. We always had snow at Easter. Rarely got to wear an Easter bonnet that didn't have "ears" to keep me warm. Thanks for sharing your lovely memory. Hi Connie! PU! When my oldest was about 2, we went to grammy's for Easter. Zach was intent on dying his own eggs and had so much fun. BUT, his hands became so covered with the various colors, his skin was pretty black in most places. It didn't come off. We went to Easter mass the next day and I couldn't stop giggling. Kai, will the student carry on the tradition this year? 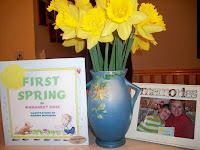 The winner of an autographed copy of First Spring is Dawn! Congratulations. I appreciate the chance to be on your blog, Kai, and look forward to having you on mine in a few weeks. Congratulations to Dawn! Thanks to everyone for sharing their Easter memories with us and thank you Mararet for the generous giveaway. I look forward to visiting your blog soon.